Good news everyone – back today with a brand new addition to my birding list. This particular bird was extremely elusive and took everything I had to get it in the tin. Unlike most of the bird species, this particular one was quite adept at navigating the Chain O’ Lakes underbrush. It was as if it knew that the Beast would be handicapped in this setting making it nearly impossible to get a bead on it. Only option was to go in after it – braving life and limb to add another notch in the camera strap. Even deep in enemy terrain, it was tough to locate. Missing was a familiar chirp or soothing song that would allow me to home in on the location. Even the rustle from its stealthy movement left very little for the ears to focus on. A rustle of leaves to the right… a rustle of leaves to the left… wait, there it is. Evolution had adapted it well to the forest floor, but the human eye has a higher power when it comes to distinguishing slight disturbances in the force – this one was a yellow streak that showed up between the leaves. Now I had it, but only a split second to get the focus on target, the manual settings dialed in and the shutter snapped. April Fool’s! Linda is going to have my hide for this one. Like last post, this one has been in the pipe for a while just looking for the perfect time. 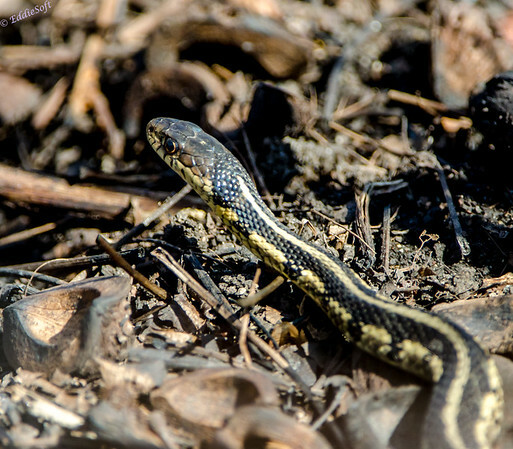 Being a new month figured it was time to give everyone a break from the birds – and what better break is there than featuring a SNAKE! Assume at this point all the sharp objects in the house are being projectiled in my general direction. I swear I get no credit for the danger I put myself in to bring you the best blog topics I can muster. The real story is my brother Ron actually found this snake. By found it, I mean STEPPED on it. He had moved into the brush on the side of a trail at Chain O’ Lakes State Park to get a better shot at an Eastern Bluebird. 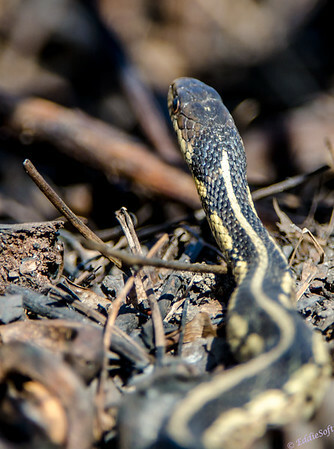 Luckily he noticed this fine specimen of a Garter Snake hunting among the dead leaves and twigs. Completely harmless for you city slickers out there, but there is something in our DNA that triggers a recoil reaction every time we encounter one of these creatures. Welcome to the new month everyone – only 5 more posts to go ha! Cute. I hope you didn’t pay too dearly for this April Fool’s joke on Linda! I’d be surprised if she didn’t retaliate with some kind of clown picture. Let’s not give her any ideas – she didn’t seem to amused after reading the post. Wait a minute.. aren’t you the one who recommended she read it – evil brother-in-law.. clown evil!